During World War II, the U.S. Government's Armed Services Editions brought much-needed reading material to servicemen around the world. The American forces serving in World War II were composed primarily of citizen soldiers—people who had no notion of going to war until Pearl Harbor was attacked. Many volunteered, others were drafted, and together the G.I.s faced a daunting combination of hurried training at bare-bones facilities, and days and weeks of transport, boredom, and fear. They experienced horrors and unimaginable scenes of violence and destruction for which no training could fully prepare them, and many found themselves in hospitals spread around the world. They were constantly reminded of their proximity to death. As one soldier remarked, it was not uncommon to have breakfast with a man who would be buried before dinner. When Books Went to War is available online or in your local bookstore. The war took a tremendous physical and psychological toll on the men who fought in it. Infantrymen plodded through endless mud, advanced as snipers fired at them, and slumbered in the comfort of rain-filled foxholes—sometimes to the lullaby of buzzing insects and squealing mortars in the distance. They always seemed to be wet, dirty, muddy, uncomfortable, and exhausted. They marched and fought through searing heat and bitter cold, they faced disease—malaria, typhus, and infections of all kinds—and bore the brunt of the enemy’s bullets and bombs. It is understandable why they believed they were damned by God. The pilots and crews of the B-17 Flying Fortresses, B-24 Liberators, B-25 Mitchells, B-26 Marauders, and B-29 Superfortresses faced different perils: flying a steady course as flak pierced holes in their planes, engaging in sudden aerial battles, and witnessing crew members suffer or die from injuries incurred midflight. Their limbs endured subzero temperatures during long journeys in unheated aircraft, and the relief they experienced upon safe return was often accompanied by the devastation of learning that others did not complete the trip back. Many planes crash-landed, ran out of fuel, or just plain crashed. The B-24s and B-26s did not earn the monikers Flying Coffin and Widow-Maker for nothing. Those in the Navy had their own problems. The initial thrill of sailing the seas and seeing the world from a gleaming ship was chilled by the isolation of days and weeks spent outside the sight of land. Loneliness and boredom took on new meanings. Meanwhile, the constant threat of lurking submarines and the mere sight or muffled din of an approaching enemy plane rattled the nerves of even the bravest sailor. There was no disguising cruisers or destroyers on the open sea. When the “music” started, they were like ducks in a shooting gallery. The days were grinding, the stress was suffocating, and the dreams of making it home were often fleeting. Any distraction from the horrors of war was cherished. The men treasured mementos of home: letters from loved ones were rare prizes; card games, puzzles, music, and the occasional sports game helped pass the hours waiting for action or sleep to come. Yet mail could be frustratingly irregular—sometimes taking as long as four or five months to arrive—and games and the energy to play them could not always be mustered after a long day of training or fighting. To keep morale from sinking, there needed to be readily available entertainment to provide some relief from war. The story of the Armed Services Editions—portable, accessible, and pervasive paperbacks—is a remarkable one. They were everywhere: soldiers read them while waiting in line for chow or a haircut, when pinned down in a foxhole, and when stuck on a plane for a milk run. They were so ubiquitous that one sailor remarked that if a man did not have a book sticking out of his pocket, he must have been naked. They were the most dependable distraction available on all fronts. Whenever a soldier needed an escape—the antidote to anxiety, relief from boredom, a bit of laughter, inspiration, or hope—he cracked open a. Every soldier and sailor abided by a strict policy of swapping and exchanging books, no matter how worn. The print could be smudged, the pages ripped or falling out, and still a book would continue to make its rounds. To throw one in the garbage was criminal. They weren’t just for entertainment and diversion. Books also served as the premier weapon in fighting Adolf Hitler’s “war of ideas.” Nazi Germany sought control over people’s beliefs, not just their bodies and territory. From the 1933 state-sanctioned book burnings in Germany to the purging of libraries across Europe as nations were conquered by the Nazis, “un-German” reading material was threatened with extinction. The scale of destruction was impressive. By V-E Day, it is estimated that Germany had destroyed over 100 million books in Europe. The story of the Armed Services Editions is largely untold. It was an astonishing effort. The government supplied over 120 million free books to ensure that America’s fighting men were equipped with spirit and resolve to carry them through their battles. With books in their pockets, American GIs stormed the beaches of Normandy, trekked to the Rhine, and liberated Europe; they hopped from one deadly Pacific island to the next, from the shores of Australia to the backyard of Japan. Some read to remember the home they had left behind, others to forget the hell that surrounded them. Books uplifted their weary souls and energized their minds. Books had the power to soothe an aching heart, renew hope for the future, and provide a respite when there was no other escape. 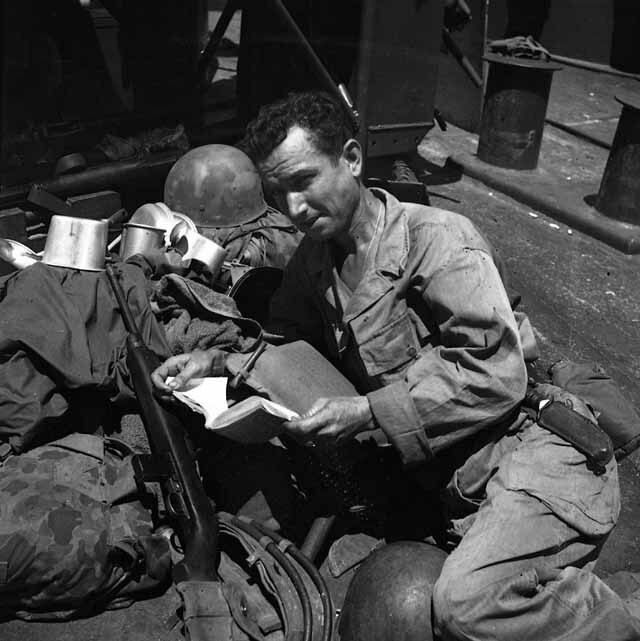 For many of America’s servicemen, books were their most important equipment. After the war, the accessibility of mass-market paperbacks—together with the GI Bill—helped build a new literate middle class, spreading reading to a wide and democratic public. The wartime books program had made The Great Gatsby into a classic, engaged dozens of authors in pen pal relationships with thousands of soldiers, and touched the minds and hearts of millions of men and women. This is the story of pens that were as mighty as swords. Tags Adolf Hitler, Armed Services Editions, book burnings, Europe, Germany, Japan, Pearl Harbor, Rhine River, Royal Air Force, V-E Day, war of ideas.